July 27, 1966: Mr. Fuji and Haru Sasaki defeated Rene Goulet and Pepper Martin to win the Pacific Northwest Tag Team titles. October 6, 1966: Rene Goulet and Shag Thomas beat Mr Fuji and Haru Sasaki for the Pacific Northwest Tag Team titles. October 27, 1966: Mr. Fuji and Tony Bourne defeated Rene Goulet and Shag Thomas for the Pacific Northwest Tag Team titles. December 10, 1966: Pepper Martin and Shag Thomas dethrone Mr Fuji and Tony Bourne for the NWA Pacific Northwest Tag titles. August 1, 1970: Mr. Fuji and Haru Sasaki defeat Beauregard and The Claw to win the NWA Pacific Northwest Tag Team titles. August 8, 1970: Mr. Fuji defeats Moondog Mayne to win the NWA Pacific Northwest Heavyweight title. October 28, 1970: Tony Bourne and Moondog Mayne beat Mr. Fuji and Haru Sasaki for the NWA Pacific Northwest Tag Team titles. November 12, 1970: Mr. Fuji and Haru Sasaki regain the NWA Pacific Northwest Tag Team titles. November 28, 1970: Tony Bourne and Moondog Mayne defeated Mr. Fuji and Haru Sasaki for the NWA Pacific Northwest Tag Team titles. May 1971 – IWA: Mr. Fuji and Tiger Jeet Sigh defeated Mark Lewin and King Curtis Iaukea to win the IWA Tag Team titles. 1972: Mr. Fuji joined Vince McMahon Sr’s World Wide Wrestling Federation. Mr. Fuji forms a tag team with Professor Toru Tanaka and were managed by the Grand Wizard. ~~~Toru Tanaka provided his massive physical strength while Mr Fuji brought his devious ring psychology to the team. June 27, 1972: Mr. Fuji and Prof. Toru Tanaka defeated Sonny King and Chief Jay Strongbow to win the WWWF Tag Team titles. August 22, 1972: Mr. Fuji receives a WWWF title shot against champion Pedro Morales. October 16, 1972 – MSG: Mr. Fuji and Toru Tanaka wrestle Pedro Morales and Bruno Sammartino in the main event of the card. May 30, 1973: Tony Garea and Haystacks Calhoun defeated Mr Fuji and Toru Tanaka to win the WWWF Tag Team titles. September 11, 1973: Mr. Fuji and Toru Tanaka defeated Tony Garea and Haystacks Calhoun to recapture the WWWF Tag Team titles. September 19, 1975 – NWA Georgia: Mr. Fuji and Prof. Toru Tanaka win the NWA Georgia Tag Team titles in a tournament final. November 14, 1973: Tony Garea and Dean Ho defeated Mr. Fuji and Toru Tanaka to win the WWWF Tag Team titles. February 7, 1976 – NWA San Francisco: Mr. Fuji defeats Pat Patterson for the NWA United States title. February 12, 1977: Mr. Fuji leaves the NWA San Francisco territory and is stripped of the U.S. title and banned. Mr. Fuji and Toru Tanaka take Classy Freddie Blassie on as their manager. September 27, 1977: Mr. Fuji and Toru Tanaka defeated Tony Garea and Larry Zbyszko in the tournament final to win their 3rd Tag titles. January 23, 1978 – MSG: Fuji/Tanaka/Stan Stasiak/Mikel Scicluna wrestled Bob Backlund/Peter Maivia/Tony Garea/Larry Zbyzsko. February 20, 1978 – MSG: Mil Mascaras defeated Mr. Fuji. May 20, 1978 – MSG: Dusty Rhodes/Mil Mascaras/Andre the Giant defeated Mr. Fuji/Toru Tanaka/Ken Patera in a “2-out-of-3” falls match. August 16, 1978 – NWA Hawaii: Mr. Fuji and Karl Von Steiger defeated Steve Strong and John Tolos to win the NWA Hawaii Tag titles. May 14, 1979 – AWA: Mr. Fuji and Toru Tanaka defeated Bill Dundee and Robert Fuller to win the AWA Southern Tag Team titles. June 29, 1979 – NWA Southeastern: Fuji/Tanaka beat Ron Fuller and Buddy Fuller to win the NWA Southerneastern Tag Team titles. 1979 – NWA New Zealand: Mr. Fuji defeated Peter Maivia to win the British Empire/Commonwealth title. ~~~Rick Martel defeated Mr. Fuji for the British Empire/Commonwealth title. January 26, 1980 – WWC: Mr. Fuji defeated Invader 1 to win the WWC North American title. May 23, 1980: Mr. Fuji and Pierre Martel defeated Luke Graham and Bulldog Brower to win the WWC North American Tag Team titles. Feb 7, 1981 – NWA Mid-Atlantic: Mr. Fuji and Gen’ichiro Tenyru beat Dewey Robertson and George Wells for the Mid-Atlantic Tag titles. July 12, 1981 – NWA Canada: Mr. Fuji defeated Angelo Mosca to win the NWA Canadian Heavyweight title. Mr. Fuji returns to the WWF and forms a new tag team with Mr. Saito, managed by Captain Lou Albano. October 13, 1981: Mr. Fuji and Mr. Saito defeated Tony Garea and Rick Martel to win the WWF Tag Team titles. June 28, 1982 – MSG: Chief Jay Strongbow and Jules Strongbow defeated Mr Fuji and Mr Saito for the WWF Tag Team titles. July 13, 1982: Mr. Fuji and Mr. Saito defeated the Strongbows to regain the WWF Tag Team titles. 1985: Mr. Fuji slowly makes the transition from wrestler to manager and took on George “the Animal” Steele as his first client. In one of the WWFs most infamous moments, George Steele and Mr. Fuji team up against Hulk Hogan and “Mean” Gene Okerlund. George Steele would eventually turn face and leave Mr. Fuji, who would then begin managing Magnificent Don Muraco. Mr. Fuji and Don Muraco were part of a famous Tuesday Night Titans skit called “Fuji Vice” – a mock soap opera. Mr. Fuji briefly managed Jim Neidhart before selling his contract to Jimmy Hart, who would create the Hart Foundation. Mr. Fuji also managed a tag team known as the Moondogs — an unorthadox team made up of Rex, King and Spot. September 14, 1985 WWF Championship Wrestling: Ricky “The Dragon” Steamboat defeated Mr. Fuji. October 31, 1985 – Saturday Night Main Event: Ricky Steamboat defeated Mr. Fuji in a Martial Arts match. December 19, 1985 – Saturday Night Main Event: Junkyard Dog and Ricky Steamboat defeat Mr. Fuji and Magnificent Muraco. WrestleMania II: Mr. Fuji managed the Magnificent Muraco in the opening match against Mr. Wonderful Paul Orndorff. Mr. Fuji brings Kamala into his stable for a brief time and even had Kamala eat a live chicken on the Tuesday Night Titans program! Magnificent Muraco hosts the Body Shop, a WWF Talk Show that replaced Pipers Pit when Piper left for a brief time. ~~~Mr. Fuji also gained the services of “Cowboy” Bob Orton who came with the Talk Show deal. WrestleMania III: Mr. Fuji manages Magnificent Muraco and Bob Orton in the opening match against the Can-Am Connection. Mr. Fuji gains the contracts of Demolition from Johnny V, and also re-introduced Killer Khan back into the WWF, as well as Sika. ~~~Killer Khan received a number of WWF title shots against Hulk Hogan. WrestleMania IV: Mr. Fuji leads Demolition to victory when they defeated Strike Force for the WWF Tag Team titles. SummerSlam 1988: Mr. Fuji (accompanied by Jimmy Hart) manages Demolition to defeat the Hart Foundation to retain the Tag titles. Survivor Series 1988: Mr. Fuji turns against Demolitions and aligns himself with the Powers of Pain. ~~~Mr. Fuji helps the Powers of Pain become the sole survivors when Fuji deliberately trips one of the Conquestadors with his cane. ~~~After the match, Warlord and Barbarian lift up Mr. Fuji onto their shoulders as the crowd gives a confused reaction. ~~~Later on in the card, Mr. Fuji and the Powers of Pain cut a promo which then confirms their heel status. WrestleMania V: Demolition defeated Mr. Fuji and the Powers of Pain in a handicapped match to retain the Tag titles. Mr. Fuji managed Kendo Nagasaki during his very brief stint with the WWF. Royal Rumble 1990: Mr. Fuji and Bobby Heenan get into a brief shoving match over Andre the Giant eliminating the Warlord. February 20, 1990 – Superstars of Wrestling: Mr. Fuji sells the Warlord and Barbarian separate contracts to Slick and Bobby Heenan! WrestleMania VI: Mr. Fuji manages the Orient Express to victory over the Rockers by count out. SummerSlam 1990: Hacksaw Jim Duggan and Nikolai Volkoff defeat the Orient Express. Akio Sato leaves the WWF and is replaced by the masked Kato (Paul Diamond-‘secret’ reunion of ex-AWA tag team Badd Company). October 9, 1990 – Superstars: Mr Fuji organised an ambush where Orient Express and Demolition ran out for a 5-on-2 attack the LOD. ~~~The signified Mr. Fuji’s reunion with Demolition – Ax, Smash, and Crush. Late 1990: Mr. Fuji teamed up with the Orient Express to face Legion of Doom in handicapped matches. Royal Rumble 1991: Mr. Fuji leads the Orient Express in the match against the Rockers. ~~~Later in the card, Mr. Fuji accompanied Smash and Crush to the ring for the Royal Rumble match. WrestleMania VII: Koji Kitao and Genichiro Tenryu defeat Demolition (managed by Mr. Fuji). Not long after, Mr. Fuji severed his ties with Demolition and Crush leaves the WWF. Mr. Fuji adds the Berzerker to his stable of wrestlers. April 24, 1991 – UK Rampage ’91: The Rockers (accompanied by Andre the Giant) defeat the Orient Express. ~~~Before the match started, the Rockers brought out Andre to counter Mr. Fuji’s interference. Royal Rumble 1992: Mr. Fuji accompanies the Orient Express in the opening match against the New Foundation. Mr. Fuji brings in the mammoth Yokozuna. Survivor Series 1992: Yokozuna makes his WWF ppv debut squashing Virgil. Royal Rumble 1993: Yokozuna wins the Royal Rumble, earning him a shot at the WWF Title at WrestleMania IX. Mr. Fuji abandons the Berzerker. WrestleMania IX: Yokozuna defeated Bret Hart for the WWF title when Mr. Fuji throws salt into Bret Harts eyes. ~~~After the match, Mr. Fuji issues an open challenge to the “Immortal” Hulk Hogan, who comes out and wins the WWF title! King of the Ring 1993: Yokozuna defeated Hulk Hogan to regain the WWF title. July 12, 1993 – Monday Night Raw: Mr. Fuji is in the corner of Yokozuna as he defeats Crush to retain the WWF title. ~~~After the match, Yokozuna repeatedly executes the Bonzai drop on Crush until Randy Savage makes the save! Mr. Fuji and Yokozuna enlist the help of Jim Cornette as their American Spokesperson. SummerSlam 1993: Lex Luger defeats Yokozuna by count out. Royal Rumble 1994: Yokozuna needed 9 other men to help him defeat the Undertaker in a Casket Match. WrestleMania X: Mr. Fuji accompanies Crush to the ring for his match against “Macho Man” Randy Savage. ~~~Later in the card, Mr. Fuji appeared two more times to co-manage Yokozuna for his matches against Lex Luger and Bret Hart. King of the Ring 1994: Mr. Fuji accompanies Yokozuna and Crush to the ring for their match against the Headshrinkers. Survivor Series 1994: Mr. Fuji accompanies Yokozuna for his second casket match against the Undertaker. WrestleMania XI: Mr. Fuji accompanies Yokozuna to the ring as Owen Harts mystery tag team partner! ~~~Owen Hart and Yokozuna defeated the Smokin’ Gunns for the WWF Tag Team titles! In Your House: Owen Hart and Yokozuna (w/ Mr. Fuji and Jim Cornette) defeated The Smoking Gunns to retain. King of the Ring 1995: Savio Vega defeats Yokozuna (w/ Mr. Fuji) by count out to qualify for the 2nd round of the KotR tournament. July 23, 1995 – In Your House: Owen Hart and Yokozuna (w/ Mr. Fuji and Jim Cornette) defeated the Allied Powers to retain. October 22, 1995 – In Your House: Yokozuna and Mabel wrestle to a Double disqualification. Mr. Fuji’s long WWF career comes to and end and is phased out of the picture. WrestleMania XII: Mr. Fuji makes a special appearance accompanying Yokozuna (recently turned face) in the opening match. Mr. Fuji made a few brief appearances in Tito Santana’s upstart American Wrestling Federation, airing on the FOX network. Mr. Fuji retired from wrestling and became a ticket-taker at a movie theatre (I think?) somewhere in Tennessee. 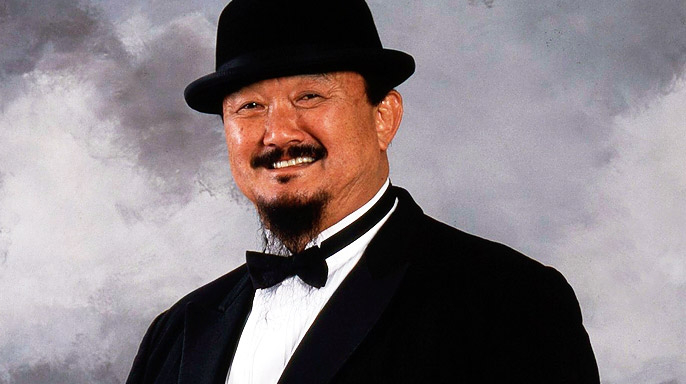 March 12, 2007 – RAW: The devious Mr. Fuji will be inducted into the WWE Hall of Fame on March 31, 2007. March 31, 2007 – Hall of Fame: Mr. Fuji was inducted into the WWE Hall of Fame by his protege Don Muraco in Detroit, Michigan. April 1, 2007 – WrestleMania 23: Mr. Fuji and the other HOF inductees were introduced to the audience at Fords Field in Detroit. August 28, 2016: Mr. Fuji passed away at the age of 82 of natural causes.